These colorful tribal earrings take only minutes to make using this earring pattern. 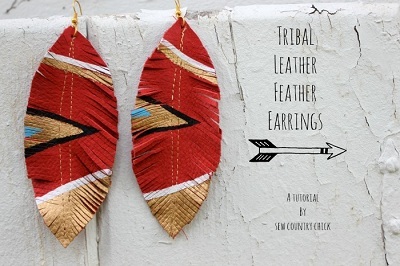 This project requires some acrylic paints and a small piece of leather to make these beautiful earrings. Once the earrings shape is cut out of leather two lines are sewn up the middle. Tape is applied to mark the design then painted. The feathered look is achieved with a pair of scissors. The pattern is a simple step by step with illustrative pictures. Have fun making earrings for yourself or to give as a gift by following this simple pattern.